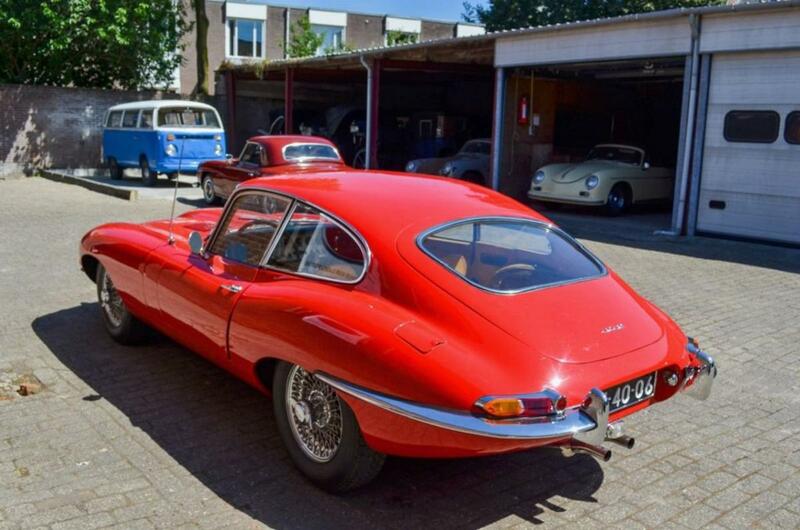 The Jaguar E type is for me one of the most beautiful cars ever made. As model I had already DT 120, but I also wanted a Mini Dinky No. 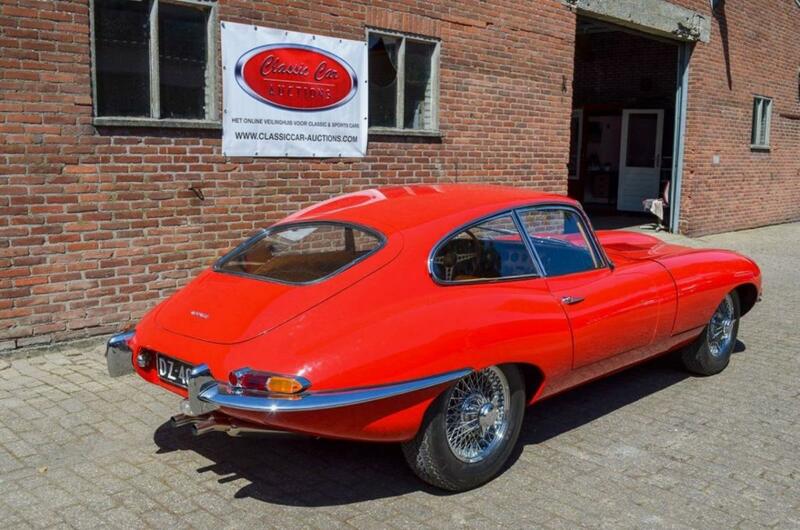 11 Jaguar E type and bought it on Ebay USA. Mini Dinky No. 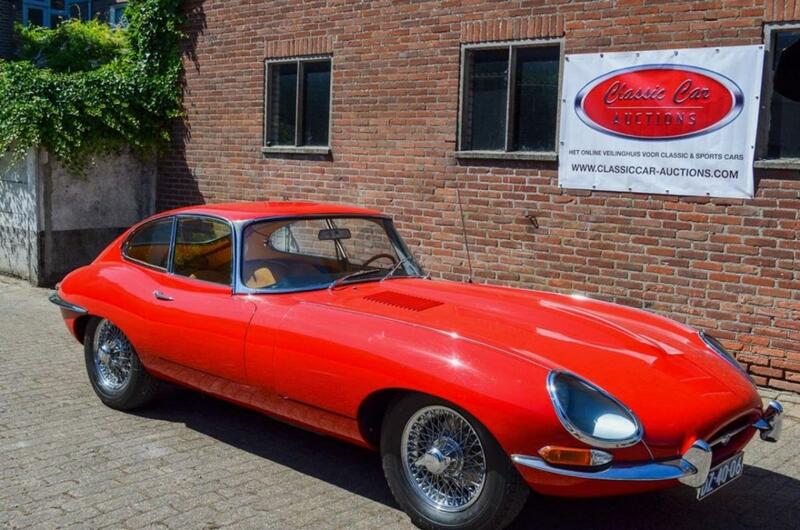 11 Jaguar E Type. Isn’t it a beauty? I doubted whether I would add my contribution to Jonathan's contribution or create a new topic, but I think the Mini Dinky deserves its own topic in the forum. That’s why I opened a general topic “Mini Dinky” for all Mini Dinkys. At the time of Jonathan's contribution, I was waiting for my Mini Dinky no.11 which I received last Monday. Given the description of Jonathan about the often very bad condition and fatigue of these Mini Dinkys it was exciting for me in which condition I would receive my Mini Dinky, but after receiving the model I concluded that the garage and the model are in a really excellent condition without any damage or sign of fatigue. As Jonathan already stated, the Mini Dinkys are not advertised in any DT catalogue. Only a USA leaflet with Mini Dinkys was published without dating the issue, but according to Keith Harvie and Ramsay published in 1968. 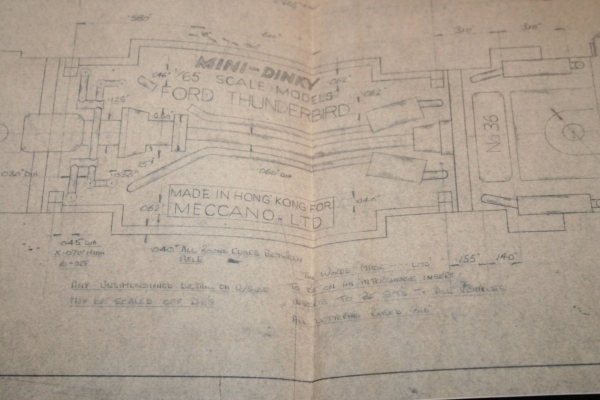 In Meccano Magazine 1967 and 1968 I could also not find any advertisement from Mini Dinky. 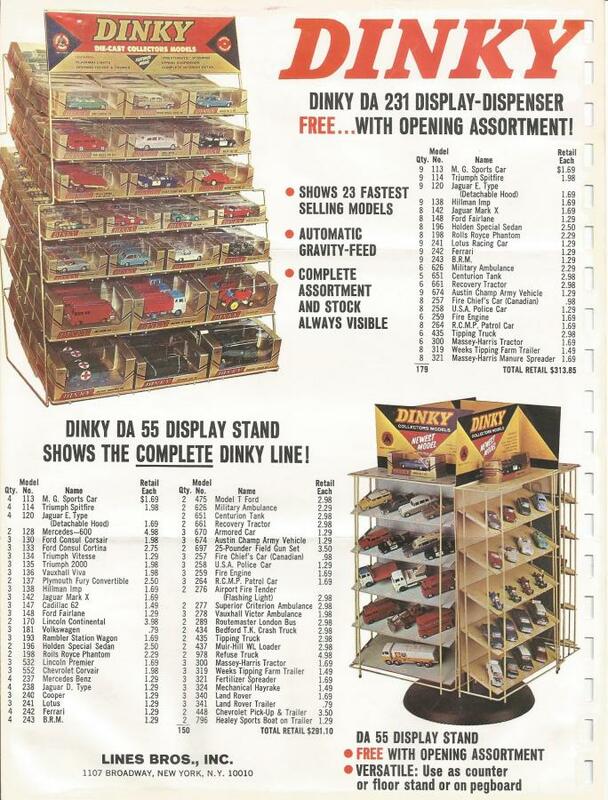 The Mini Dinkys were probably sold mainly in the US, given the American prices on the leaflet. 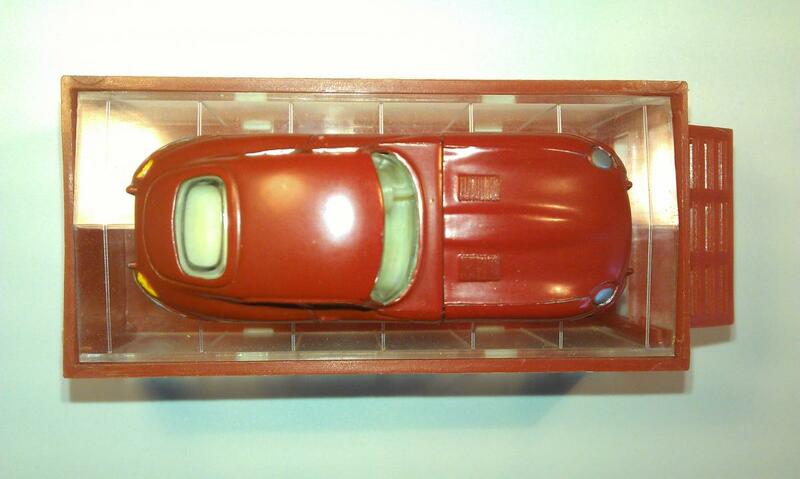 Mini Dinky cars were made in the scale 1/65 and came in its own free garage with up and over sliding doors. The illustrated US-issued Mini Dinky fold-out launch leaflet includes also construction vehicles models 94-99, scale 1:130. 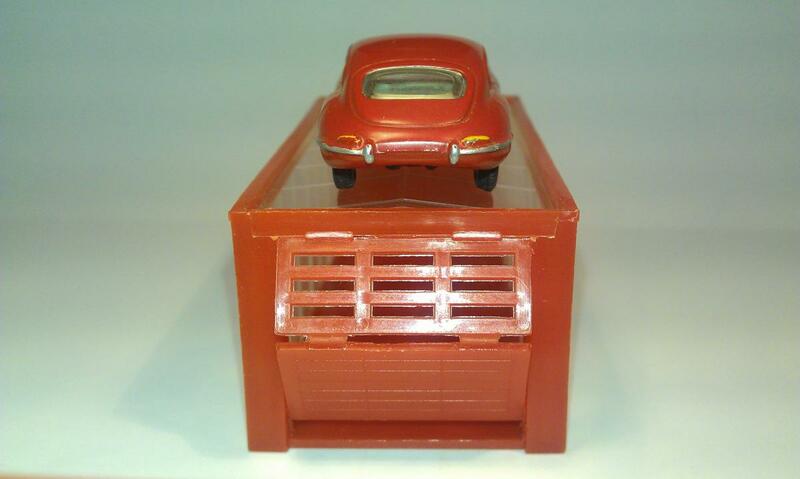 It is indeed incomprehensible that Lines Bros chose to produce this small scale, in which Matchbox already had been market leader for years with Fred Bronner in New York as USA distributor and the production of Dinky Dublo had long been finished. Mini Dinky leaflet USA 1968. 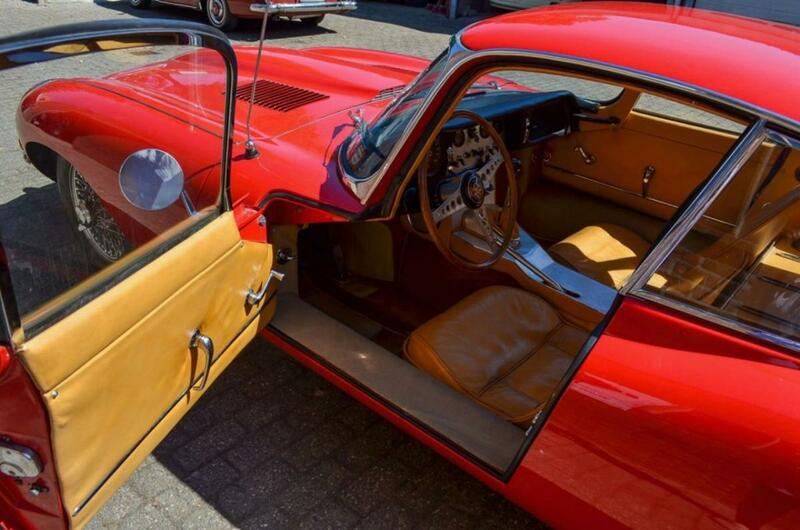 Every model comes in its own free garage with sliding doors. 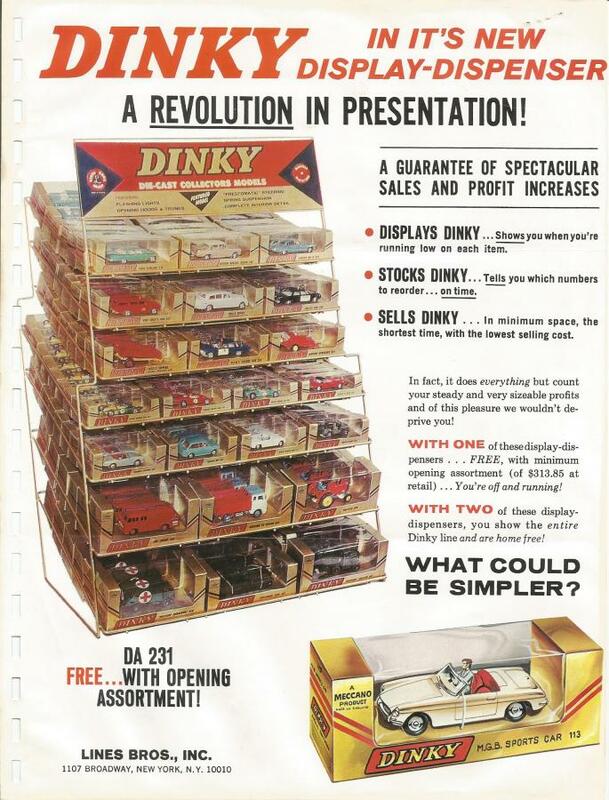 1) The Mini Dinky leaflet in 1968 states the text on the front side: Now Dinky Toys introduce Mini Dinky. 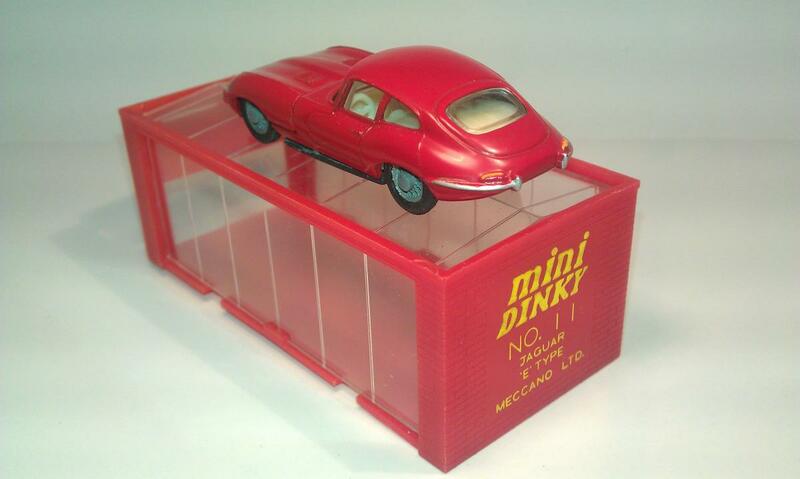 A fabulous new range of 1 / 65th scale all-metal die-cast models and on the back side: Mini Dinky and Dinky Toys are made by Meccano England. 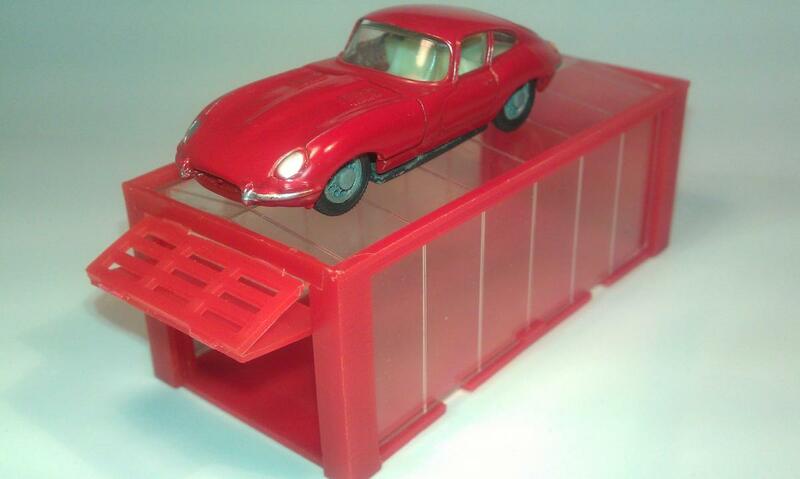 2) The following text has been printed on the base of the model: Mini-Dinky 1/65 scale models No 11 E type Jaguar. 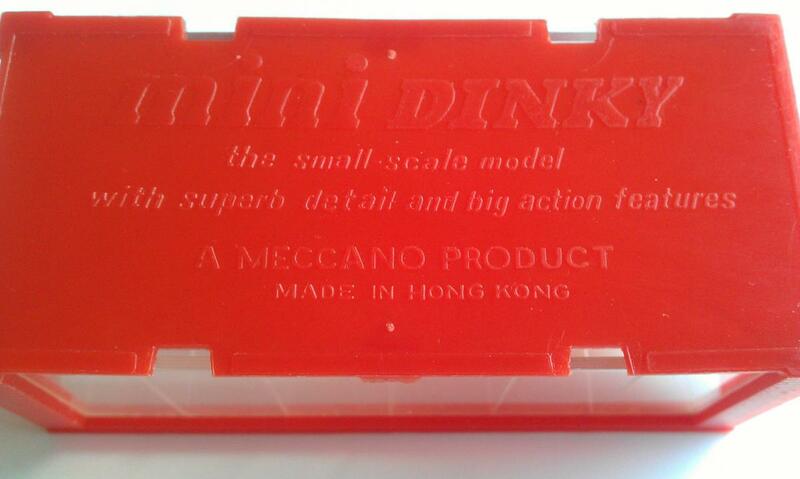 Made in Hong Kong for Meccano Ltd.
Because the production was arranged by Lines Bros Ltd as the owner of Meccano Ltd at that time all this clearly indicates the legalization and authorisation of the production of Mini Dinkys for Meccano Ltd England as brand name Mini Dinky and meets all the authenticity features of a Meccano Ltd product, such as a Dinky Toys. 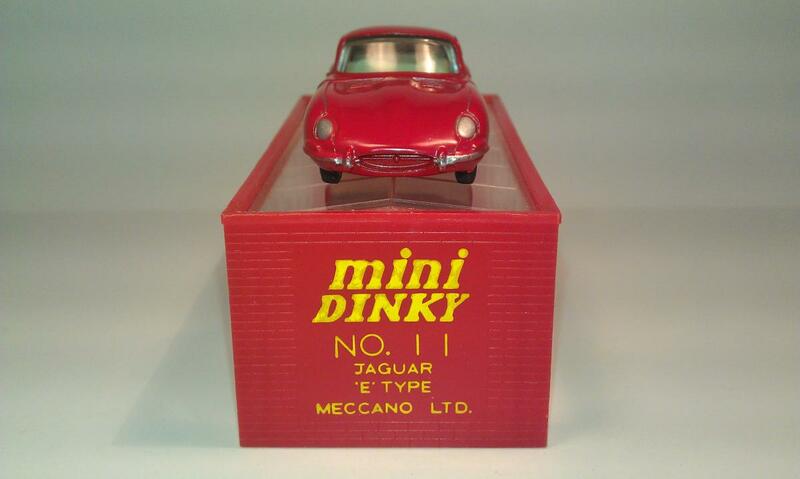 That’s why a Mini Dinky belongs in my opinion to be included in the original Meccano Dinky Toys range. 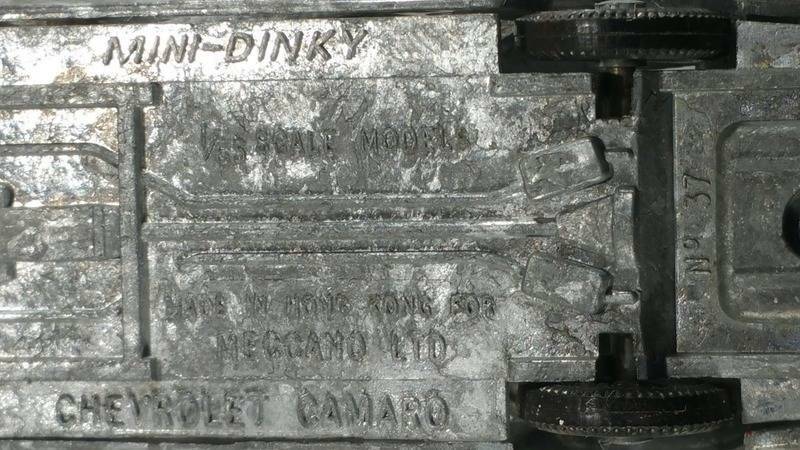 That the Mini Dinkys were made in Hong Kong (for Meccano Ltd) and were of lesser quality than the normal Dinky Toys does not change this. 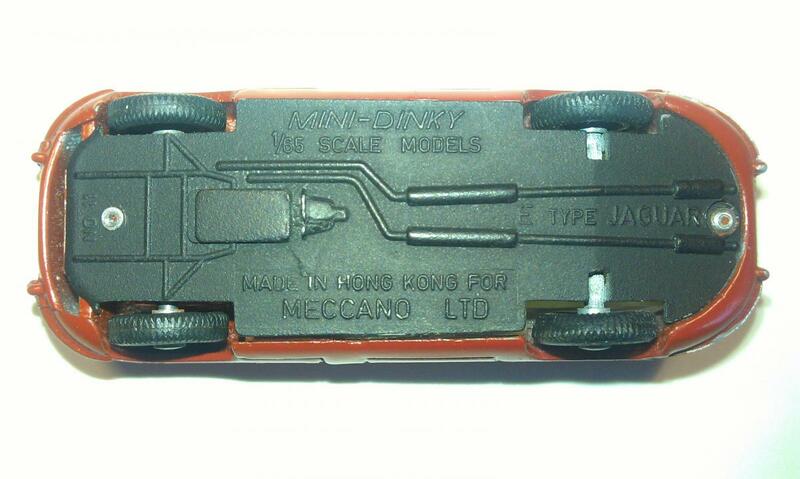 Base of the Mini Dinky No 11 E type Jaguar with print Made in Hong Kong for Meccano Ltd. 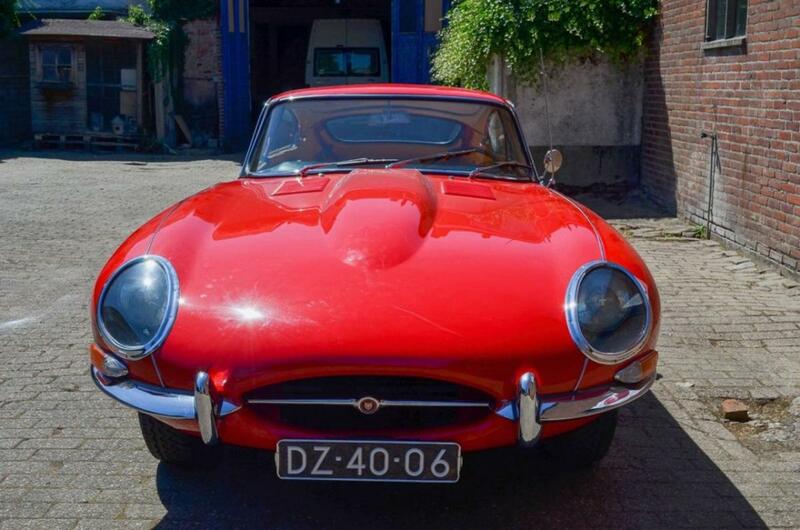 I show pictures in full size of my Mini Dinky Jaguar E type and of an authentic Jaguar E type 1962 with Dutch license plate. 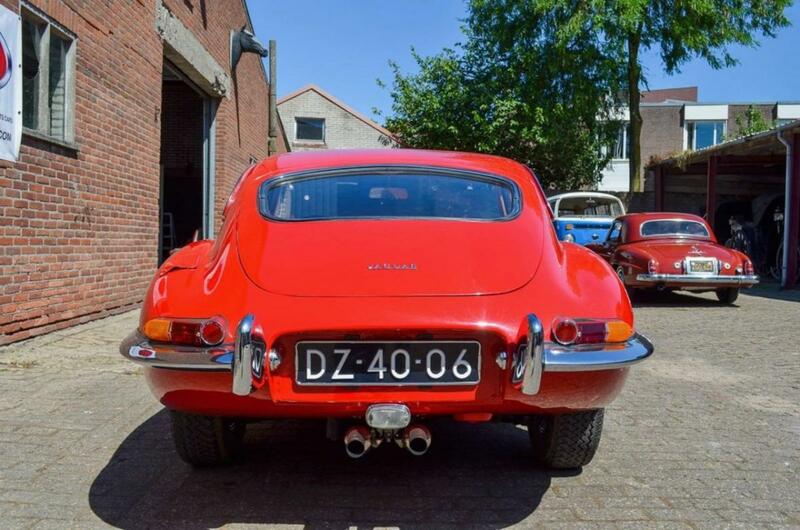 Kind regards, Jan Oldenhuis, 28 September 2018. Jan, thank you for your comments and for reproducing the Mini Dinky leaflets, which I have copies of but not readily to hand! 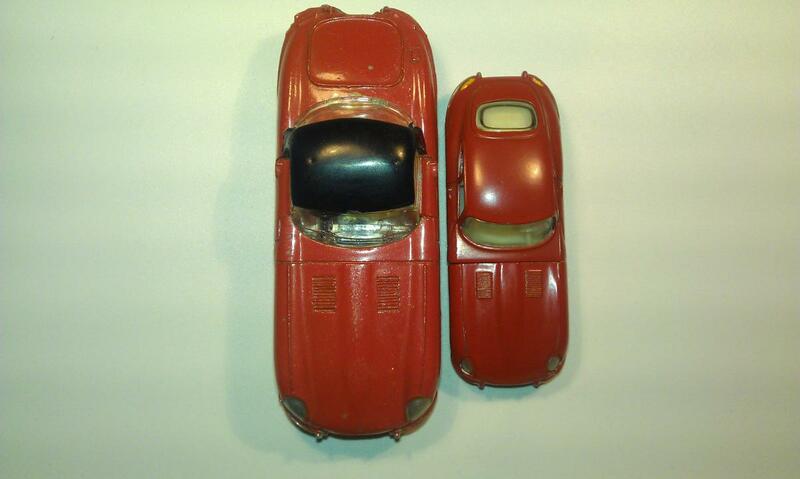 It is worth noting that at the same time as Mini Dinky models being sold for 59 and 69 cents in the U.S., the more robust and widely distributed Matchbox models were 55 cents. The list above of planned Mini Dinky models is far from complete. 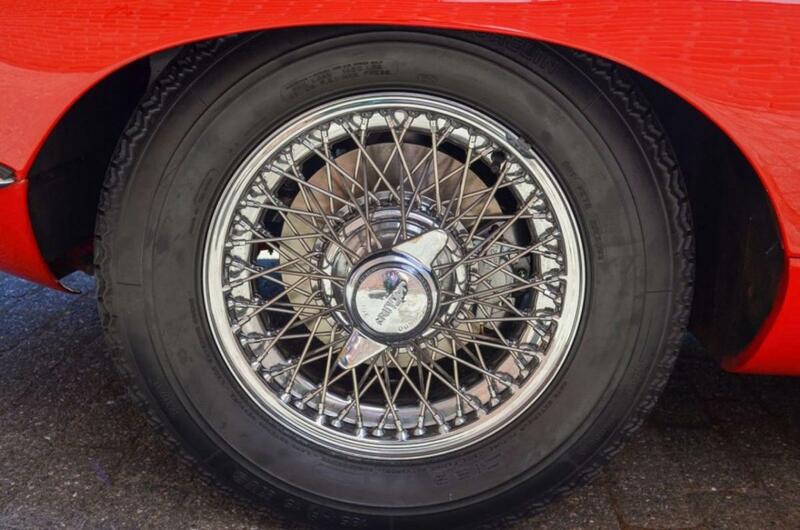 For example, #33 was to have been a Jaguar Mark X, 35 was to have been a Rambler Ambassador, 36 was to have been a Ford Thunderbird, and 37 was to have been a Chevrolet Camaro. 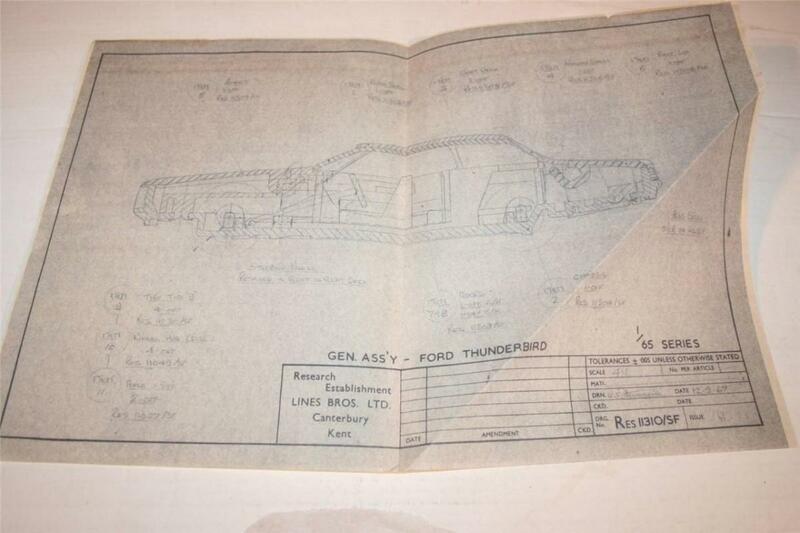 Here is a drawing for the Thunderbird, and a pre-production Camaro model. 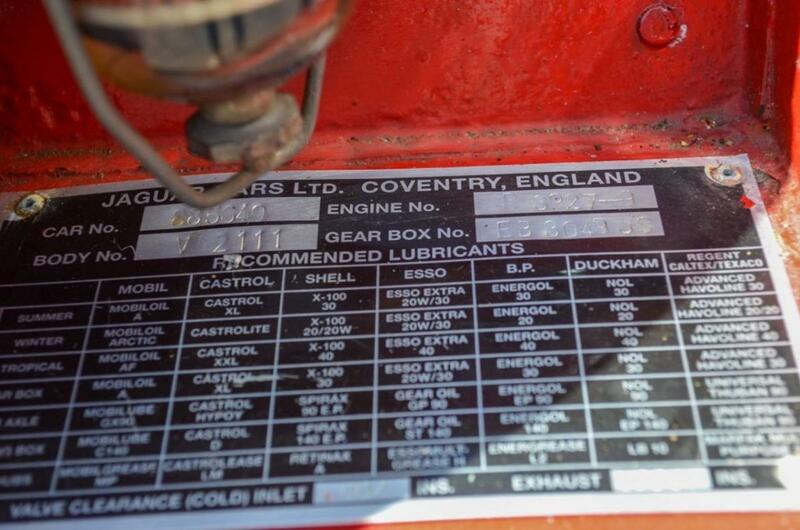 Both images taken from the Swifty's Garage website, which offers additional Mini Dinky information. Meanwhile, in a "senior moment" I did not remember until looking at the Thunderbird that there was an excellent article by Peter Dauvellier in the April 2018 DTCA Journal. 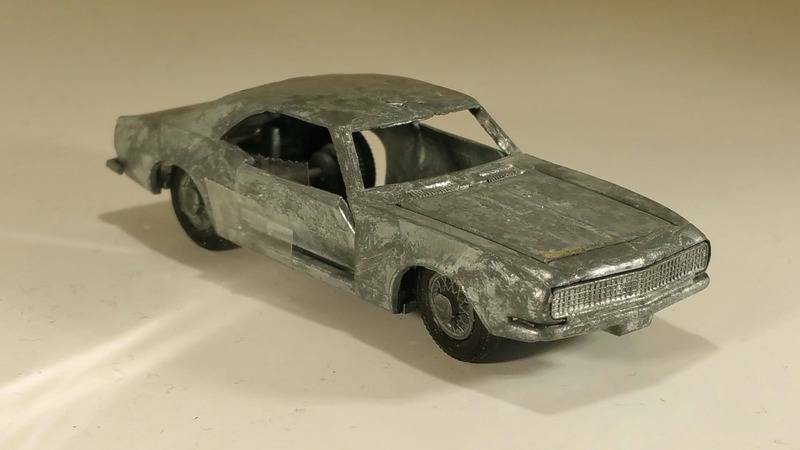 Peter had acquired the Thunderbird blueprints and various pre-production models from Andy Wooler (the eBay user Ziggeystardust whom I mentioned in my other post), and he has re-created the model using 3D printing. 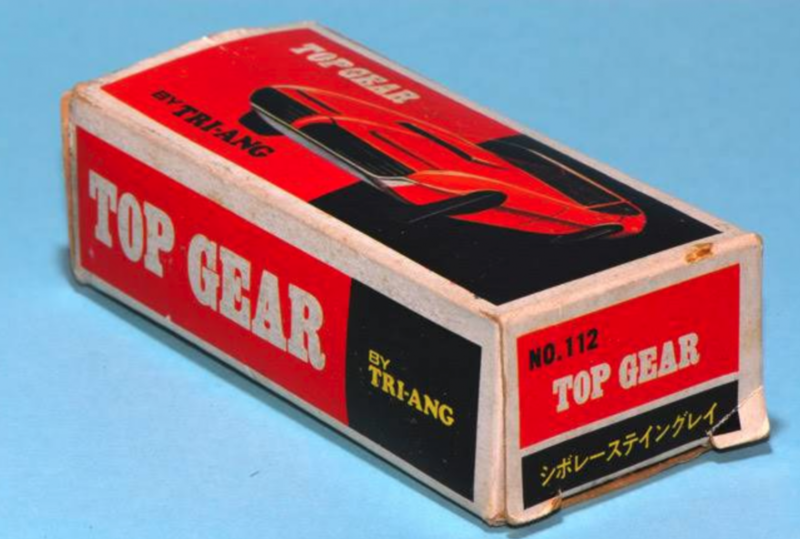 After the Mini Dinky experiment, Tri-ang used some of the tooling for a short-lived range called Top Gear (which Peter also noted in his article). 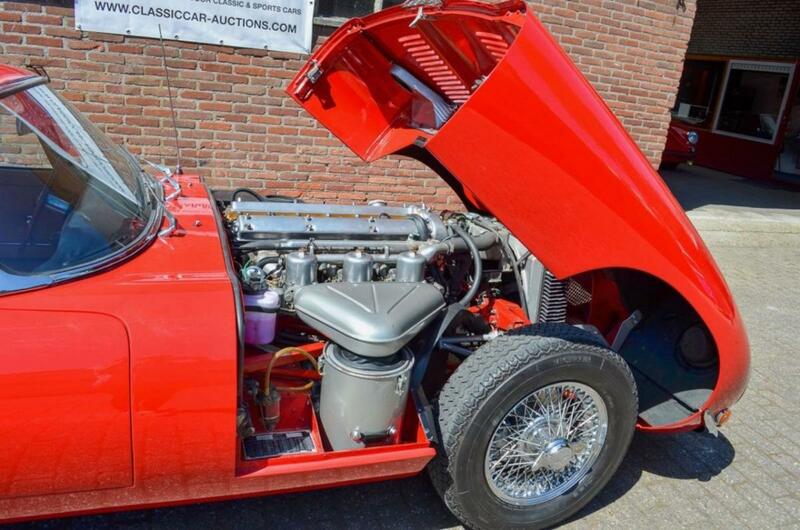 Here are pictures of the former Mini Dinky Corvette. Two styles of Mini Dinky display. I own one like the one on the right; it came without the sign so I had wondered why it was too small to hold most Dinky Toys. Apparently the rack beneath the sign was designed to hold copies of the Mini Dinky leaflet. Jonathan. These are very interesting pictures of a Mini Dinky display and that you have such a display makes your Mini Dinky collection very nice. I had never seen it anywhere. It is a proof that Lines Bros took seriously the promotion of the Mini Dinky in the stores. Maybe they were only used in the US. I did not find them at Vectis. 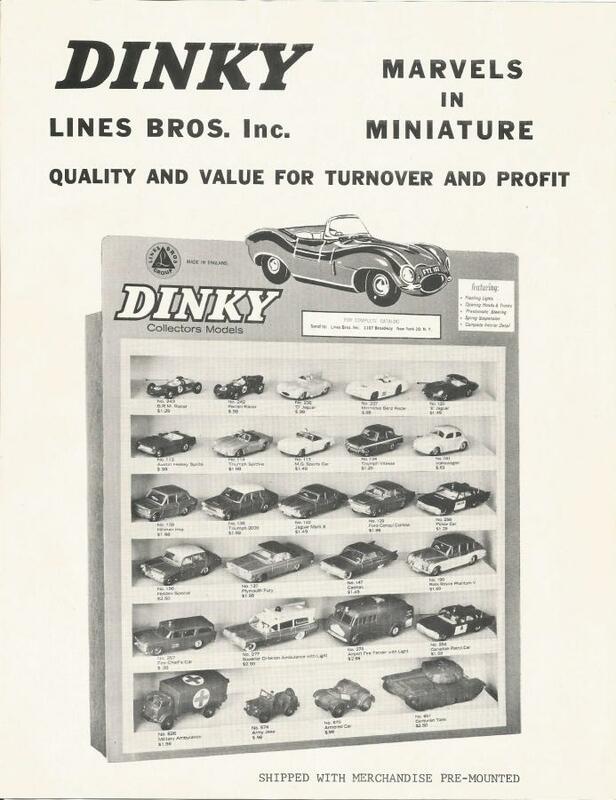 I have 2 sales brochures of Lines Bros Dinky Toys display stands, one in color and one in black and white, probably from 1964 and a Lines Bros order form of 31 January 1965. 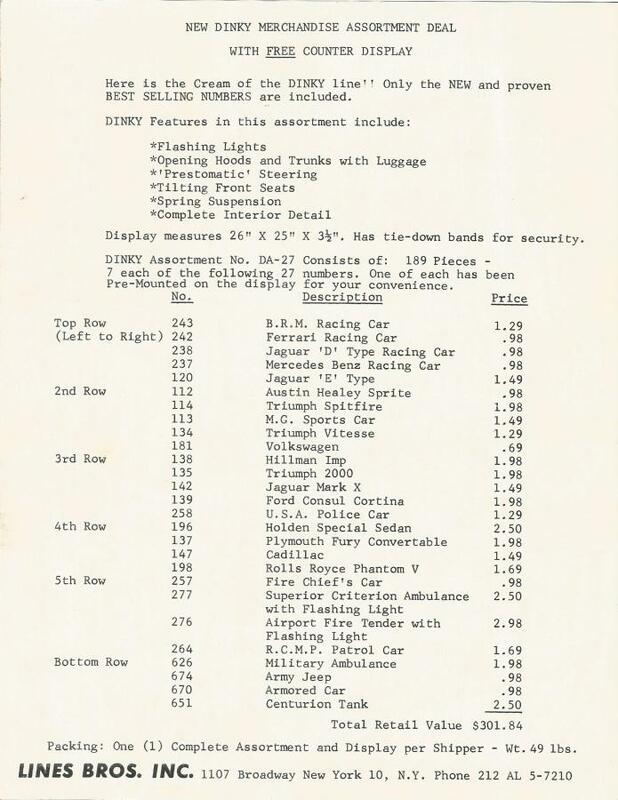 If you compare these Lines Bros brochures with a Meccano UK price list of December 1964 you see a big difference in the number of available models in the US and UK. 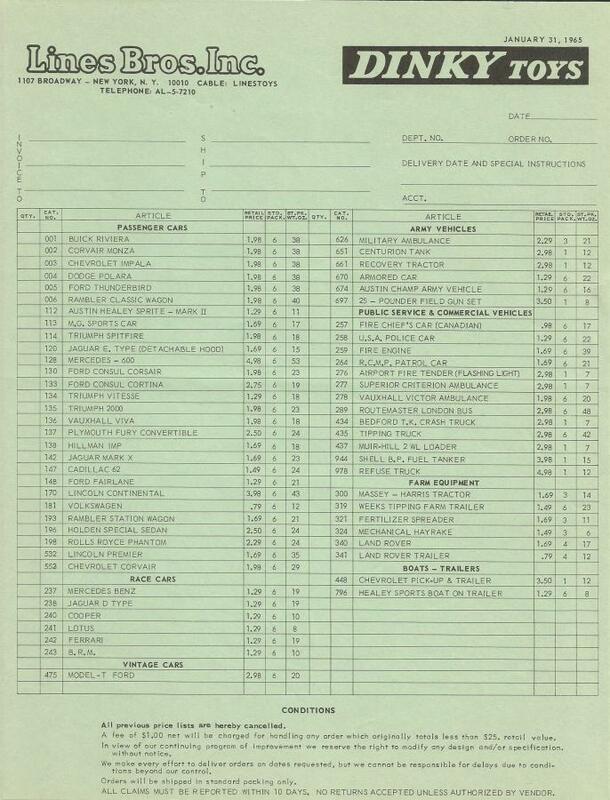 The Lines Bros order form 1965 count 62 models, while the Meccano price list UK of December 1964 count about 170 models. As can be seen on the color brochure, the Lines Bros even shows a Dinky DA 55 Display Stand with the complete Dinky line!! I count 54 models on the attached model list. That is more than 1/3 fewer models than in the UK. 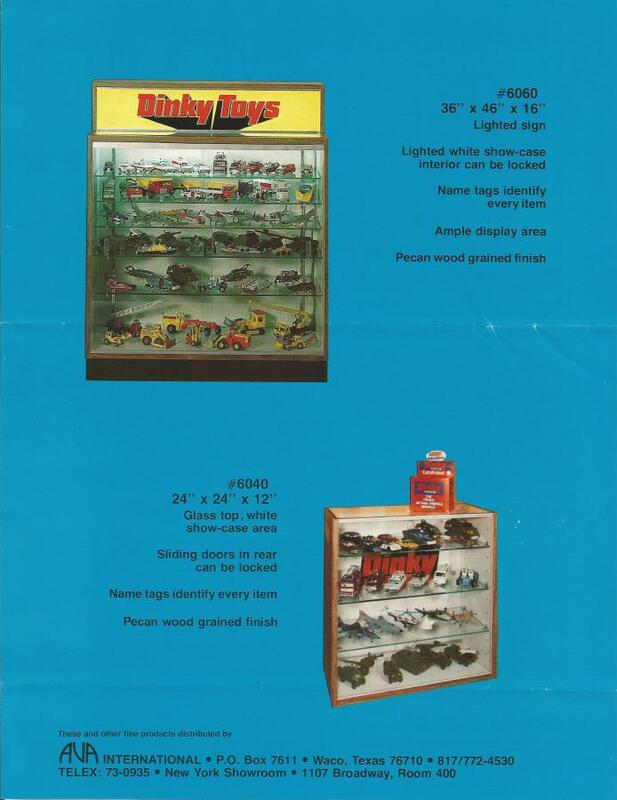 I also show a 1975 sales brochure of Dinky Toys displays from AVA International Waco Texas together with the Promotional letter about the Dinky Toys displays 1975 from AVA International. 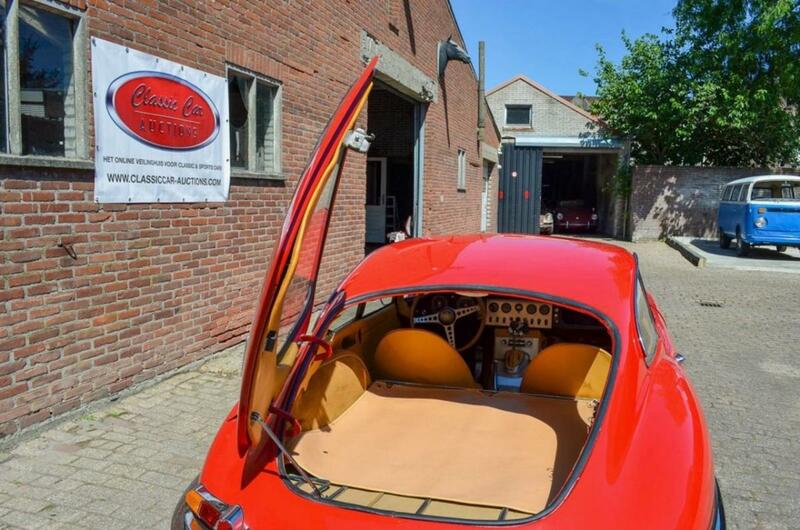 Note: That article in the DTCA Journal of April 2018 by Peter Dauvellier and Marco de Vries about the Mini Dinky No 36 Ford Thunderbird is very interesting. 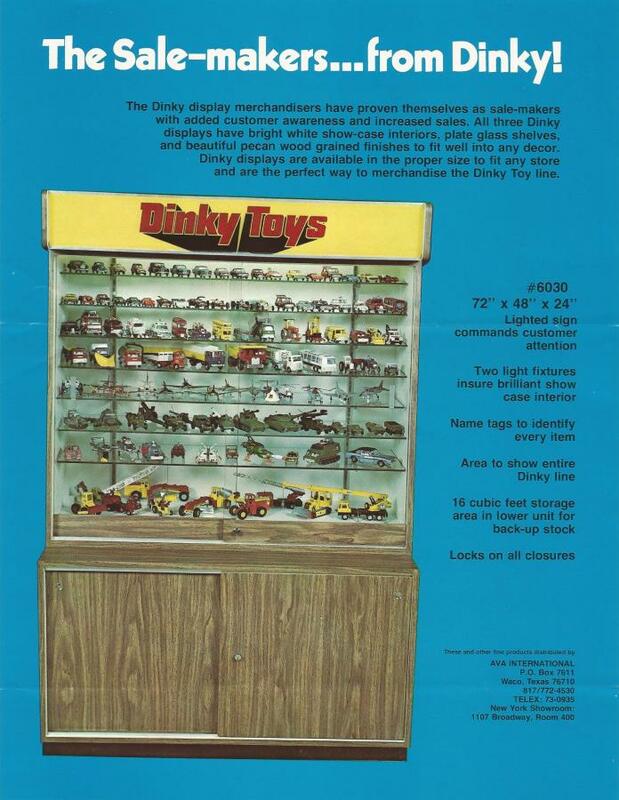 The Dinky Toys Encyclopedia by Jacques Dujardin also provides much information in an article in: MiniDinky> Mini> ArticleMini. 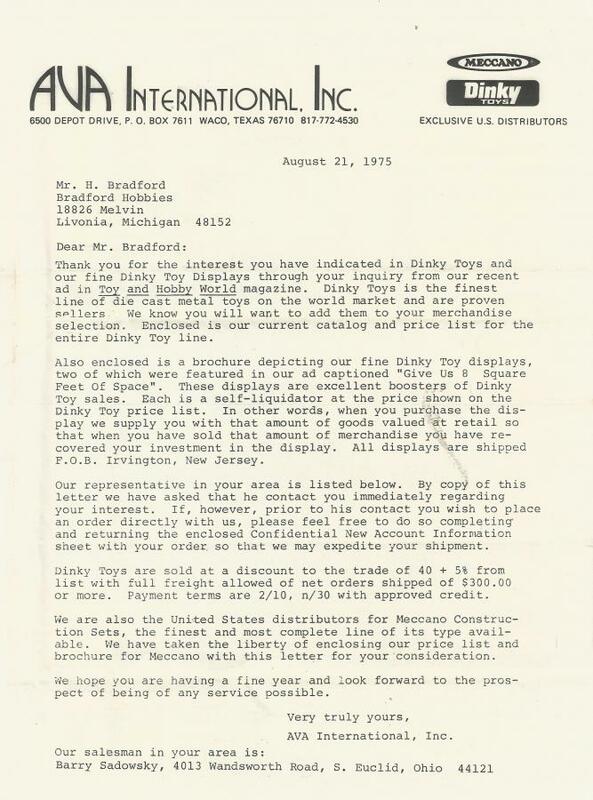 Indeed, when Lines Brothers took over U.S. distribution in 1964, they cut the number of Dinky Toys sold in the U.S. way back -- as Gilbert also had done in 1963 ... and they had the temerity to describe this as a good thing for retailers. That was one of the reasons I disliked them at the time, as well as their intriduction of the Gold or Yellow "Visipac" boxes, which, though they may be sought after by some collectors today, are pretty horrible! 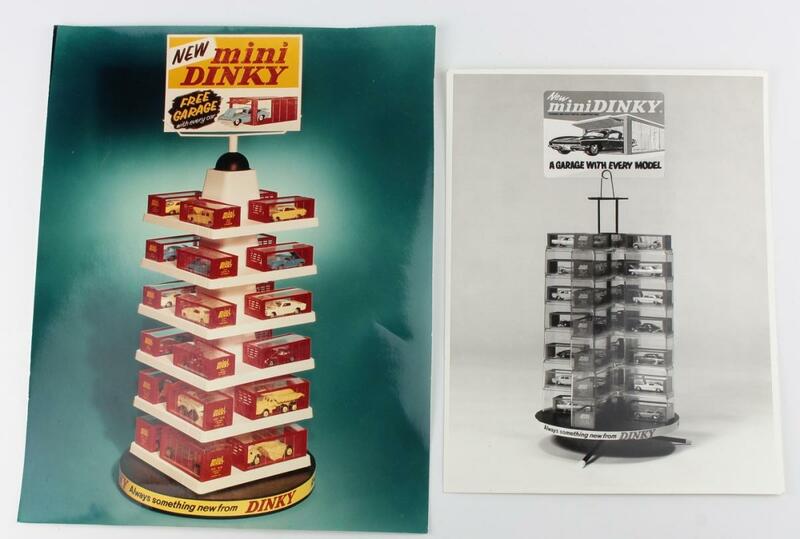 Regarding the Mini Dinky display, as noted, I have one but did not know what it was until I recently found the promotional photo (currently on offer by QDT). Now I shall have to evict the models that are currently inside, stock the case with Mini Dinky models, and create a replica sign. I'm thinking that, yes, the Mini Dinky display cases may only have been used in the U.S. As I mentioned earlier, Mini Dinky models were sold in the UK, which I know from having purchased some in London in 1972, but, as seems also to have been the case in America, they were sold in different outlets from regulst Dinky Toys. As for the large AVA cases from 1975, I thank you for reproducing the advertising brochure for them, as I did not have such a good copy before. 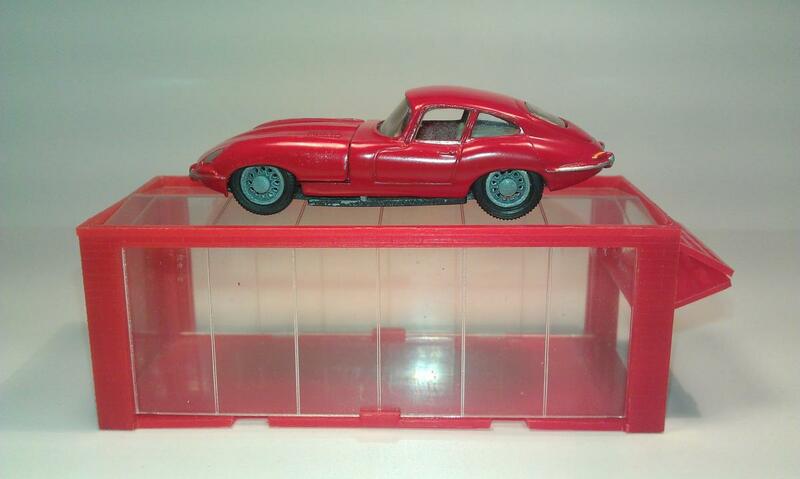 I own two of these display cases, into which most of my Dinky collection has been crammed. They are impressive but also a lot of trouble, since each is in one piece (the top and bottom ought to have been separable) and they are solid chipboard -- very heavy and extremely difficult for two men to move, even when all the glass has been taken out. The shipping costs AVA incurred must have been considerable! 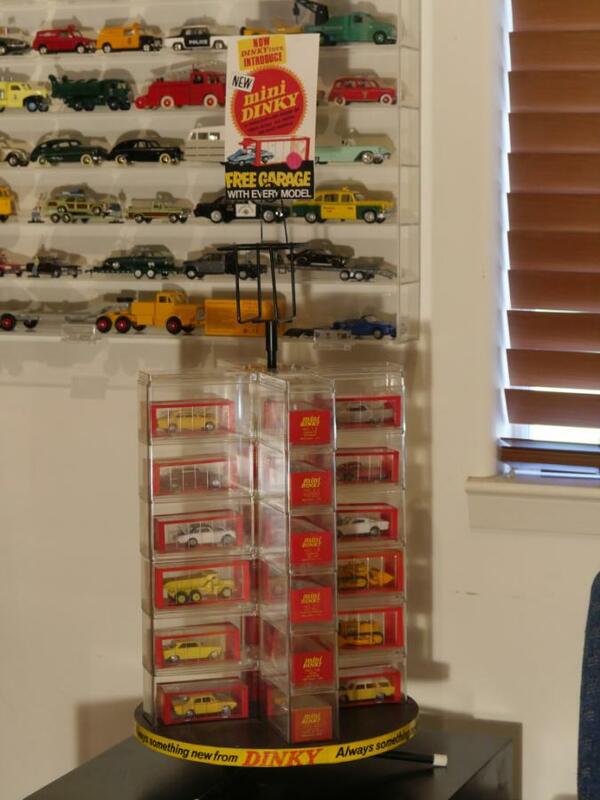 Here is my Mini Dinky display, with appropriate models installed ... how many others are still in existence? 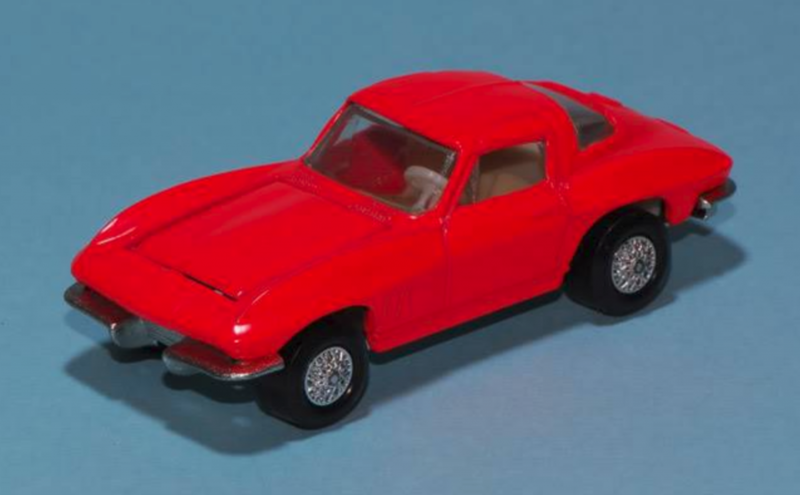 I am glad to have it now, but to find this in a local shop around 1966 or 1967, with these inferior models, when I was unable to purchase real Dinky Toys from Liverpool, was tantalizing indeed.